Fort McHenry is a historical American coastal pentagonal bastion fort located in the Locust Point neighborhood of Baltimore, Maryland. It is best known for its role in the War of 1812, when it successfully defended Baltimore Harbor from an attack by the British navy from the Chesapeake Bay on September 13–14, 1814. It was first built in 1798 and was used continuously by the U.S. armed forces through World War I and by the Coast Guard in World War II. It was designated a national park in 1925, and in 1939 was redesignated a " National Monument and Historic Shrine". During the War of 1812 an American storm flag, 17 by 25 feet (5.2 m × 7.6 m), was flown over Fort McHenry during the bombardment. It was replaced early on the morning of September 14, 1814 with a larger American garrison flag, 30 by 42 feet (9.1 m × 12.8 m). The larger flag signaled American victory over the British in the Battle of Baltimore. The sight of the ensign inspired Francis Scott Key to write the poem " Defence of Fort M'Henry" that was later set to the tune " To Anacreon in Heaven" and became known as " The Star Spangled Banner", the national anthem of the United States. The Frenchman Jean Foncin designed the fort in 1798,  and it was built between 1798 and 1800. The new fort's purpose was to improve the defenses of the increasingly important Port of Baltimore from future enemy attacks. The new fort was a bastioned pentagon, surrounded by a dry moat—a deep, broad trench. The moat would serve as a shelter from which infantry might defend the fort from a land attack. In case of such an attack on this first line of defense, each point, or bastion could provide a crossfire of cannon and small arms fire. Francis Scott Key, a Washington lawyer who had come to Baltimore to negotiate the release of Dr. William Beanes, a civilian prisoner of war, witnessed the bombardment from a nearby truce ship. An oversized American flag had been sewn by Mary Pickersgill for $405.90  in anticipation of the British attack on the fort. When Key saw the flag emerge intact in the dawn of September 14,  he was so moved that he began that morning to compose the poem "Defence of Fort M'Henry" that was later set to the tune " To Anacreon in Heaven" which would later be renamed " The Star-Spangled Banner" and become the United States' national anthem. During the American Civil War the area where Fort McHenry sits served as a military prison, confining both Confederate soldiers, as well as a large number of Maryland political figures who were suspected of being Confederate sympathizers. The imprisoned included newly elected Baltimore Mayor George William Brown, the city council, and the new police commissioner, George P. Kane, and members of the Maryland General Assembly along with several newspaper editors and owners. Francis Scott Key's grandson, Francis Key Howard, was one of these political detainees. Some of the cells used still exist and can be visited at the fort. A drama beginning the famous Supreme Court case involving the night arrest in Baltimore County and imprisonment here of John Merryman and the upholding of his demand for a writ of habeas corpus for release by Chief Justice Roger B. Taney occurred at the gates between Court and Federal Marshals and the commander of Union troops occupying the Fort under orders from President Abraham Lincoln in 1861. 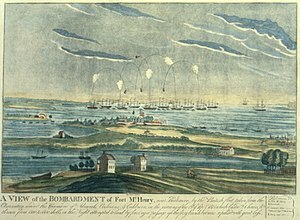 Fort McHenry also served to train artillery at this time; this service is the origin of the Rodman guns presently located and displayed at the fort. During World War II, Fort McHenry served as a Coast Guard base. Used for training, the historic sections remained open to the public.